From data duplication to predictive modeling, machine learning tasks are revolutionizing the business world. When used to its fullest potential, machine learning frees businesses from wasting resources on repetitive and time-intensive tasks of all kinds. When it comes to data duplication, in particular, optical character recognition (OCR) releases companies from wasting time on manually inputting data from documents. The OCR engines can quickly derive accurate information from business cards, invoices, bank statements, receipts and many other paper documents. Read on to learn about how machine learning and OCR engines are helping facilitate excellent business growth across all industries. Beyond saving time and resources, OCR helps business owners effectively organize their documents by digitizing them in full. The redundant physical and digital storage of documents helps protect you from the potential loss of vital paperwork. As you scan your documents, the intelligent engine recognizes and duplicates characters with a high degree of accuracy. The system even attempts to maintain the document format for easy recognition and readability. The ability to accurately recognize and duplicate document text and formats makes OCR the perfect way to digitize receipts. Companies can harness the power of this system to change how they approach storage and usage of receipts for their operations. 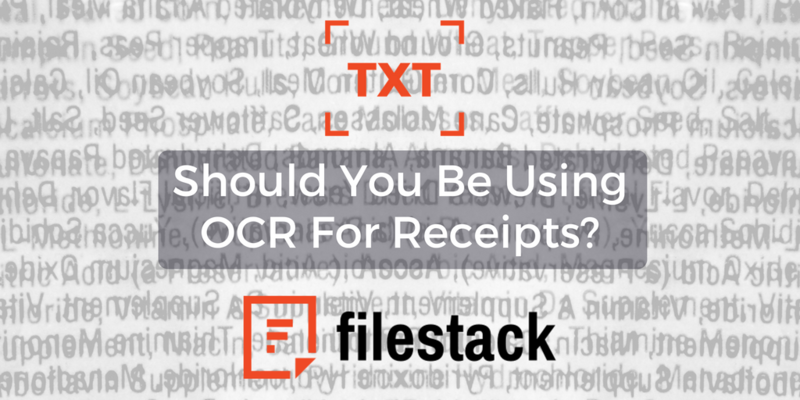 You can make a small change by embracing Filestack OCR for receipts to transform your business operations in a big way. To optimize the business environment for positive annual growth, companies must tap into machine learning processes to effectively reallocate resources. You can use Filestack OCR in many different ways to streamline your operations across the board. Here are a few ways to get started. The sheer accuracy of OCR engines makes them a true asset in tracking expenses for budgeting reasons. The data pulled from the receipts can create a clear picture of your company’s budget health and areas in need of improvement. Unlike on paper receipts, which have a tendency to fade, the digital data remains accessible for year to year comparisons used to better understand business growth metrics. Digital receipts allow companies to breeze through the valuation process by always having asset and liability figures on hand. As the receipts enter the OCR system, you can direct the data to the appropriate storage channels for your valuation calculations. Once you have figures in hand, you can seek investors and shareholders with confidence, knowing you have all data backed by physical proof. Companies that use OCR for receipts in their business operations are rewarded as soon as tax season rolls around. For both quarterly and annual tax needs of small businesses, OCR goes above and beyond in facilitating the filing process. Your stored receipts will allow you to make the appropriate claims for transportation, advertising, entertainment, travel, equipment and more to reduce your company’s tax obligations each period. If you are looking for a way to optimize your business operations, start with the digital filing of your receipts. You can say goodbye to digging through paper receipts for your company with Filestack OCR services. Here at Filestack, we focus on meeting business needs with our purpose-built machine learning models. We will help you through the process, so you do not have to build your own machine learning team. Respond below or reach out directly to let us know how you plan to use Filestack OCR to meet your business needs. Should You Be Using OCR For Your Business Cards?